Ubiquity, for those who don’t know it, is a wonderful Firefox extension offering you all sorts of commands to do a number of tasks without leaving your current context. For you Mac users out there, it’s like Quicksilver but in the web browser. Difference is, Ubiquity can interact with your web browser and its content in all sorts of ways, making it extremely powerful! 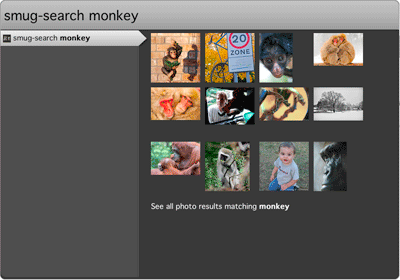 Overall, I really like the SmugMug service, so why not offer a Ubiquity command to search SmugMug photos for desired term(s)? The result lists the 12 first matches, and also a link to the result page of all matches. Install Ubiquity (Click Get it now in that page). Go to the smug-search page. If you have Ubiquity installed, a bar should appear at the top of your web browser window, asking you if you want to subscribe to the smug-search command. Click Subscribe and off you go! You might also want to try out the rob-search Ubiquity command, to use Ubiquity to search amongst all the posts in this web page.